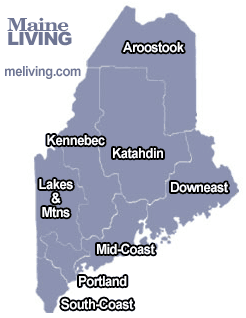 The Lakes & Mountains Region of Maine is an ideal place for your outdoor adventure. The land of hundreds of small and large lakes, rivers and streams makes Western Maine one of the most beautiful natural regions in New England. Popular hiking and backpacking destinations include: Sugarloaf, Sunday River, Sebago Lake Region, Poland Springs, and the Appalachian Trail. Western Maine is also home to many State Parks with well maintained trails, facilities and wildlife. Please share your Maine hiking comments. To feature your business, contact us. Douglas Mountain has short ascents through woods to open ledges with beautiful views of the Presidential Range, Pleasant Mountain, and Oxford Hills. 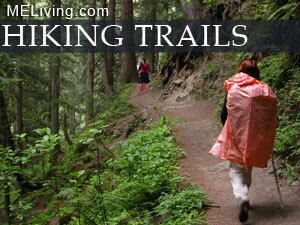 This is a good family hike with well marked trails. Base to summit is 1/4 mile. Elevation gain is 300 feet. Sugarloaf mountain is a strenuous climb, the second highest in Maine. There are amazing views all along the way, following the ski lift to the summit. The base of Sugarloaf to Spaulding Mountain summit is 5 miles. Elevation gain to Sugarloaf summit is 2500 ft.
Grafton Notch State Park is located on Route 26 between Newry and Upton, Maine and offers opportunities for sightseeing, picnicking, and hiking on its 3,000 acres of beautifully natural terrain. Interpretive signs explain the glacial sculpting of Screw Auger Falls and the formation of Mother Walker Falls. A quarter-mile loop trail leads to Moose Cave with its narrow gorge decorated by lush lichens and mosses. Both short and long day hikes extend through this spectacular, scenic area at the end of the Mahoosuc Range. The 2,000-mile Appalachian Trail passes through the park on the way to the trail’s northern terminus, Mount Katahdin.